where n1 is the refractive indices of the medium from which the beam comes, and n2 the refractive index of the other medium. Beyond that angle, Snell's law for the calculation of the output angle could not be fulfilled for any real output angle. Essentially, the component of the wave vector along the interface, which would have to be identical for the incoming and the transmitted beam, is so large for the incoming beam that it cannot be matched by a transmitted beam even with an output angle of 90°. 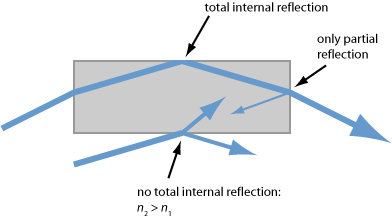 Figure 1: For the upper light beam traveling through a glass block, total internal reflection occurs at the upper interface, but not on the right side, as it requires that the angle of incidence is above the critical angle. Also, for the lower beam there is no total internal reflection, as it comes from the medium with smaller refractive index. 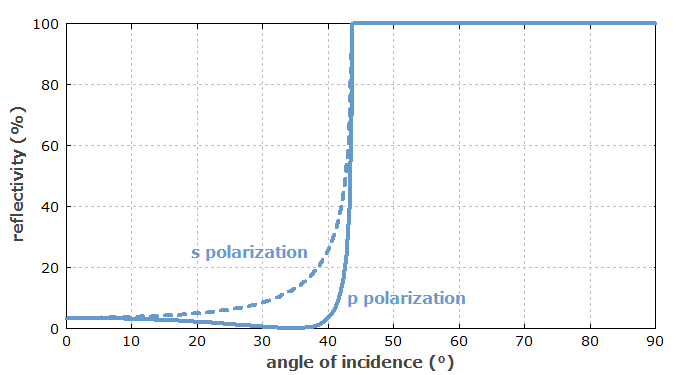 Figure 2 shows how the reflectivities for s and p polarization depend on the angle of incidence, if the light comes from a medium with refractive index 1.47 (e.g., silica at 1064 nm), and there is air on the other side of the interface. For both s and p polarization, the reflectivity becomes 100% (assuming perfect surface quality) above the critical angle, which is in this case 43.6°. Figure 2: Dependence of the power reflectivity on the angle of incidence, if the light comes from a medium with 1.47 and there is air (n = 1) on the other side of the interface. The guidance of light in optical fibers can be understood on that basis. The acceptance angle for a multimode fiber can be calculated using the equation above in combination with Snell's law for the refraction at the input face. Monolithic ring resonators can be fabricated where total internal reflection occurs at all or some of the interfaces. For an example, see the article on nonplanar ring oscillators. In slab lasers, total internal reflection allows one to realize a zig-zag path through the gain medium, which has various advantages. The evanescent field can also be exploited in various ways, e.g. in chemical sensors or in experiments of atom optics. 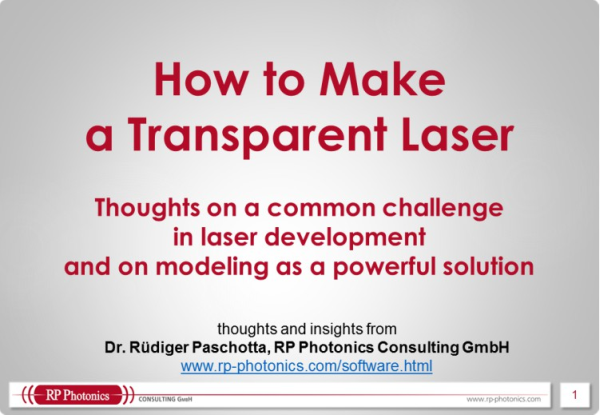 Particularly in slab lasers, total internal reflection can lead to parasitic lasing. In light-emitting diodes, total internal reflection makes it difficult to efficiently extract the generated light. Although all optical power is reflected at the interface, i.e., no power at all is transmitted, the optical field somewhat penetrates the second medium The field amplitude of that evanescent wave decays exponentially – in most cases with a very short decay length, so that some field intensity can be detected only very close to the interface. Only for beam angles close to the critical angle, the decay is relatively slow. The exponential decay can be understood as the consequence of an imaginary wave vector component perpendicular to the interface. The Poynting vector has no component perpendicular to the interface, as there is no energy transport in that direction. Another detail is a small lateral displacement of the reflected beam with respect to the position which may be expected. This corresponds to a reflection point which is not at the interface but slightly shifted into the second medium. That shift is named the Goos–Hänchen effect after the persons who discovered it . If there is a second interface to a denser third optical medium so close to the first interface that it touches the evanescent field, some light may be transmitted into that third medium, and the reflectivity of the interface is reduced accordingly. That phenomenon is called frustrated total internal reflection (FTIR) – which is somewhat misleading, as the reflection is no more total. The effect can be interpreted as a kind of tunneling. As an example, frustrated total internal reflection may be used for input/output coupling of an optical resonator. When a prism is put closer and closer to a reflection point of the resonator, more and more light can be coupled in or out. The distance control needs to be very precise, as the coupling strength reacts very sensitively to small changes of the gap width.